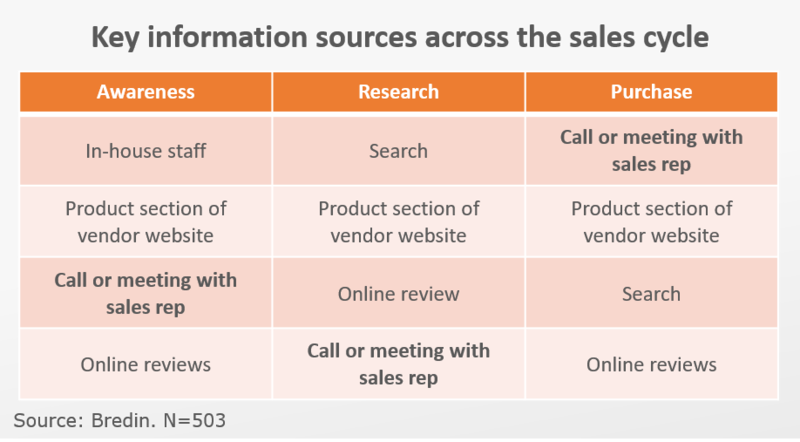 Despite the rise of “self-service” product research by SMBs, your sales team still plays a critical role – from introducing new offerings to closing the deal. In recent Bredin research SMBs told us that sales reps are important at every stage of the sales cycle. SMBs rate peers and events the most important out of 36 possible sources of product information. After those, SMBs rate meetings with salespeople high at every stage. But how do you help make your sales team truly effective at every step? The answer: content. SMBs consistently report wanting sales reps who understand their business concerns and can clearly articulate product payoff and how other businesses have benefited from what you sell. Awareness. An email newsletter generated by your marketing team can be personalized to look like it is sent by a salesperson or account rep. Bredin research shows high levels of SMB interest in email newsletters; our client experience confirms that they are a highly effective way to stay top of mind and enhance a thought leadership position. How-to content addressing a business challenge – articles, Q&As, guides and others – communicate that you understand your prospect and can address their business concerns. Lead gen. High-value, registration-required content is a great way to drive leads to your sales team. For example, survey-based research reports enable SMBs to compare themselves to their peers, whose perspective they value highly. Interactive tools, where registration is required to obtain a complete evaluation, can also be effective lead gen devices. Research. The content formats that work best to support SMB research into your offerings are video, guides, research reports, interactive tools like quizzes and calculators, sell sheets, case studies, and checklists or worksheets. These can be posted to your resource center; and promoted in an email newsletter, used in a campaign or delivered by your rep.
Meeting and event support. Equip your sales team to make the most of in-person meetings by giving them meeting scripts, brochures or sell sheets, case studies, presentations, videos and worksheets or interactive tools to provide pricing / configuration / order support. Purchase. To help the salesperson close the deal, give them configurators or pricing tools that can help them determine the exact solution that best meets the prospect’s needs, the total associated costs, delivery / implementation timing, and other specifics. Sales support. To keep your sales team effective, give them ongoing education such as overviews of key industries, information on the buyer journey or personas, and tips on how they can best utilize sales tactics such as events or phone calls. Need help developing great SMB sales content? Contact Bredin at info@bredin.com. Stu is responsible for setting Bredin strategy, as well as day-to-day management of company operations including marketing and business development, partnerships and alliances, product development, finance, operations and HR. A frequent speaker on marketing to SMBs, Stu has more than a decade of technology sales and brand marketing experience at IBM and Nabisco Brands. Stu holds an MBA from the Amos Tuck School at Dartmouth College.